The Tsugami M08J CNC Lathe offers 3-jaw hollow 8” chuck, rigid 2-axis turning center with a manual tailstock, programmable quill, and A2-6 spindle nose. The touch sensors are used to achieve machine accuracy by measuring the thermal displacement. This small footprint machine is rigid in construction and is ideal for wide range of applications such as turning, drilling, boring, and thread cutting operations. Rem Sales introduces the M08J – Tsugami’s extremely rigid, 2-axis CNC lathe. Tsugami/Rem Sales, the exclusive North American importer of Precision Tsugami machine tools, announced today its newest machine offering; the Tsugami M08J, an incredibly rigid 2-axis turning center with a manual tailstock, programmable quill, and A2-6 spindle nose. The Tsugami M08J CNC Lathe features a rigid construction using boxed ways for the X-axis with oversized linear guides for the Z-axis for heavy-duty machining. Thermal displacement compensation comes standard on the M08J, which allows for the highest level of machine accuracy by measuring the thermal displacement using the touch sensors installed on the X-axis slide. All of this is packed into a conveniently small footprint – 67 inches x 66 inches x 63 inches. The Tsugami M08J is the perfect lathe for a number of applications such as turning, drilling, boring, and thread cutting. Options for the Tsugami M08J include the addition of high pressure coolant, foot pedals, and a chip conveyor. 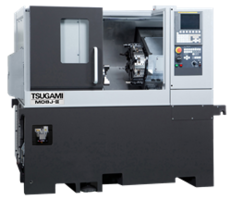 For more information or a pricing quote on the Tsugami M08J, visit the “Machines” page at http://www.remsales.com or contact your local distributor.